Hosting a holiday party and no idea what to wear? Do not fret, I am here to help. In hosting, many, many, many, parties I have learned a few things about dressing the part of hostess. 1. One does not have time to re-apply lipstick or gloss. I would suggest buying a long lasting color. I have a few of Chanel's Ultra Wear Lip Colour and love them! Every once in a while you may want to re-apply the clear top coat so your lips do not feel dry and a mirror is not needed. I keep my lip color in the kitchen drawer during parties. 2.If you are cooking, then wearing a watch is a must. It is very difficult to hear the kitchen timer go off over stimulating conversation and music. 4.I wear simple jewelry. I find bracelets and cocktail ring are in the way while preparing food. 5.I now wear an apron. I have destroyed too many pretty frocks to count by not wearing one. 6. I find wearing heels along with cooking/hosting do a number on my back and slow me down, cute flats? Yes, please! 7. 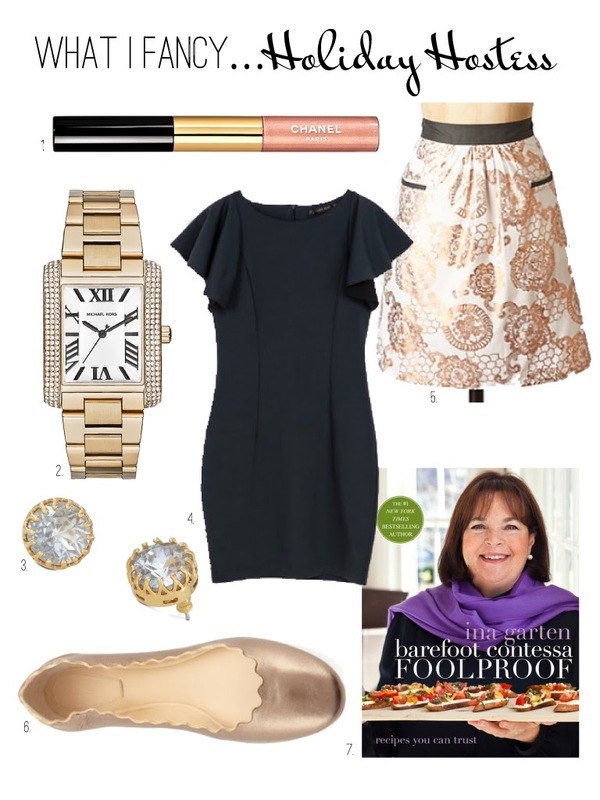 I cannot rave enough about Barefoot Contessa. In FoolProof, I highly recommend making the Slow-Roasted Filet of Beef (page 122). Perfection every time! I will no longer prepare my tenderloins any other way. Love Penne alla Vecchia Bettola (page 158) and the Salted Caramel Brownies (page 216)..pure heaven!!!! I hope this helps and most all have fun! Thank you for stopping by.